His name is Jose Luciano. He’s the pastor of a church in Santo Domingo called Iglesia de Dios Misionera. Like many bi-vocational pastors of small churches, he’s wrapped himself up in his work and used ‘busy-ness’ as an excuse for not being the shepherd that God called him to be. As a result, his flock was struggling to find their purpose and identity in Christ as well. But all of that is different now. Pastor Jose joined a group (supported by LoveServes International) that provides him with valuable training and mentoring. That’s his coach, Rafael, sitting proudly next to him as Jose tells us about how serving his community has not only transformed his life, but also the lives of the people in his congregation. They make regular visits to hospitals and the infirm in their area. Their desire is simply to minister to the needs of the people who are physically unable to take care of themselves. It doesn’t matter what the needs are, or whether the person is a member of the church or not. Where ever there’s a need, they try to meet it. It’s become about living the Gospel for Pastor Jose and his church. The best part of this isn’t just the renewed vision and purpose for the Body, it’s how they accomplish it. Like many other churches in poor areas, resources are limited. But they don’t sit around and wait for resources to come in from wealthy U.S. churches. They take matters into their own hands. They start by doing what they can with whatever they have in front of them. And when there’s more need, they turn to the (secular) marketplace. Many women in (and outside of) the church bake food that can be sold in the local markets as a way to raise money to support their projects. The church has become totally self-reliant while going out and making a big impact on their community. The only outside resource that Pastor Jose has gotten is the training and mentoring that helped him launch his church in this new direction. I’ve been on other mission trips where our presence and what we could offer was a dominating factor. Taking food to people is important when it comes to filling an immediate need, but what happens when the food is gone? Fixing a generator that stops working is awesome, but what happens when it stops working again after the expert mechanic leaves? The immediate needs certainly need to be addressed, but it seems that a critical part of foreign missions is to support long-term success… not to create a dependence on what we can bring. Please hear my heart… I’m not knocking short-term missions in any way. Lots of good gets done on trips of all kinds. But in order to have the greatest long-term impact we’ve got to make sure that we’re focusing on the right things. Our presence should be in the background, while lifting up the arms of those who’ll remain long after we’re gone. Is it okay to meet the immediate needs? Sure it is. But when we bring fruit, let’s also bring seeds and garden tools, and show them how to farm their own food. Often the poverty we encounter isn’t one of physical resources, but the knowledge and wisdom needed to maximize those resources. How do you support long-term change as opposed to meeting just the immediate need? I think part of the great difficulty here is recognizing the long term issues that create an overwhelming amount of short term problems. I have friends that work for US Agency for International Development and its a constant struggle to define what they call “sustainable development” ie – the long term stuff that is going to make a difference once the outside help goes away. My church currently has a number of long term mission projects out there that are primarily involved with empowering and supporting pastors to really do the work of the ministry. It’s encouraging to know that others are doing similar things as well. i know that it can be extremely difficult defining “sustainable development”, especially when we look at it from the lens of our own cultural norms. in my (limited) experience, it seems that education is a BIG one… and not just developmental education for children, but also adult vocational education as well. i’ll have some more posts in this series from my trip to the Dominican Republic that touch on this idea a little bit. i’d LOVE to hear more about some of the long term mission projects out of your church! what exactly are they doing? where are they doing it? how did they identify the long-term need? i’m wondering if you’d be interested in writing maybe a guest post or two here about some of that work…. interested? Tell you what. I’m going to grab one of our missionaries who’s actually doing the work and get him to get in touch with you. I’ve been hanging out doing backyard kind of stuff so i can’t really tell you about what things are like for our buddies overseas. That would be awesome too Seiji! You rock dude! This is where the rubber meets the pavement, isn’t it, Dude? I once heard a missions leader say about his involvement in other cultures: “We give them Jesus. We don’t bring any of our man-made traditions. We let them incorporate worship into their culture in their own unique way.” This might scare some people, but I think for the Gospel to have a lasting impact, it needs to be part of the culture. I feel like I’m not making sense but I’m too tired to do any better. In other words–we shouldn’t ask them to change their culture to accept Christ as their savior. this is EXACTLY where the rubber meets the road… it reminds me of when i was in Africa worshiping with various churches before we did our teaching. some of the churches sang beautiful British and American style hymns… and hearing them with their Swahili accents sings was quite beautiful. but then to hear them sing native-tongue worship songs was simply jaw-dropping… the passion was incredible. Hey BibleDude, you’ve done a great job at sharing the powerful impact that LoveServes International is having in the local churches in the Dominican Republic. 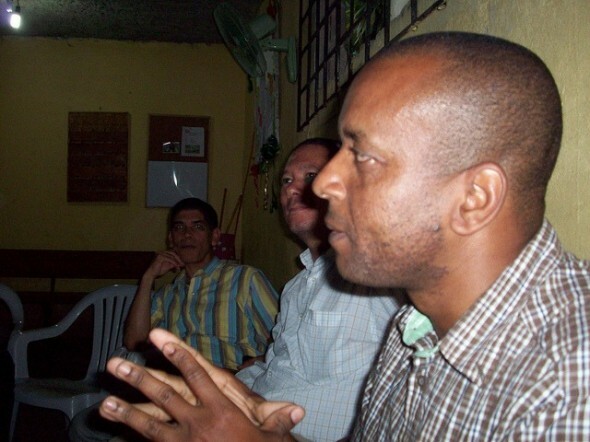 Pastor Jose Luciano is a great example of how God can use even the poorest churches to transform their community. It doesn’t take a lot of money, it takes Believers (the saints) that are equipped to do the work of the ministry to build HIS Kingdom. (Eph. 4:12) It’s a simple strategy that Jesus gave us. “Love God, Love your neighbor”. He then gave us the Holy Spirit to empower us to do all that He has called us to accomplish for His glory! Jesus was in the business of meeting needs! This opens the door to people’s hearts. When someone has met a great need in my life, I am forever grateful and feel a connectedness with them. When poor indigenous Christians give what little they have to help their non-believing neighbor, it is amazing what miracle takes place in their hearts. It becomes synergistic because people want to become involved in the work of the ministry! This too, helps create sustainable development. Look at the 12 disciples…2000 years later…Millions and Millions have come to Christ.